We had an absolutely amazing time in Oklahoma, we are so grateful to have had this opportunity! It is already time for us to compete at the Colorado Regionals! This Regional will be held at the DU Ritchie Center from March 21st to the 23rd. Thursday will be a practice day where we can fine tune our robot. Friday and the first part of Saturday will be qualification matches where we will compete against other teams. The last part of Saturday will be finals and awards. Everyone is invited to this regional, so make sure to invite your friends and family to join us as we compete on Friday and Saturday! Below is a tentative schedule from the FIRST website. More information can be found directly on their website using the link. We had the honor of demoing our robot at the Junior FIRST Lego League Expo at Willow Creek Elementary! During the event, a number of kids got the chance to explore our robot Antoinette's Revenge! We also answered questions from the kids and parents about our team and FIRST Robotics in general. The kids were so exited to explore and learn more about our robot! We were so honored to have the opportunity to help inspire the next generation of young engineers! Thank you more than words can say for your invaluable participation at the Expo. Getting to see and operate your “big” high school robot is truly the highlight of the Expo for many of these Jr. kids. I hope you took note of the huge smiles on their faces, because a smile says a thousand words! You have inspired the next generation—who knows, they may even end up on your team in a few years! I was impressed by the cool way you handled robot malfunctioning issues and the way you calmly problem-solved how to keep the kids engaged. That was truly invaluable, because at an Expo the size of Willow Creek, we can’t have four or five teams “at loose ends” and roaming the halls, with nothing to do during a session; we want all their time to be constructively used, and you did a beautiful job of ensuring that happened. The coaches and parents’ grateful comments confirmed that the kids had a blast! I was also deeply grateful for your help in putting away the chairs in the gym. That saved me a ton of time and effort and allowed me to focus on putting classrooms back in order and other areas of clean up. That was truly the hugest help!! I have attached a Gracious Professionalism certificate that I hope you can add to your Chairman’s file or other evidence for your FRC judges at competition. I firmly believe that your judges should know what an impact you have had." We’d like to give a huge thank you to everyone who attended and sponsored our silent auction! We are very grateful as well to the Elks Lodge #1650 for hosting our team and for their generous donations. A huge shout out to all the mentors, team members, and our families for great teamwork and hard work in preparation for and at the event! We were able to raise a little over $2,200! As Build Season is only a month and a half away, we have been given the amazing opportunity to compete in both the 2019 Oklahoma Regional and the 2019 Colorado Regional! We are super excited to compete in both Regionals and hopefully Championships in Houston, but we need the community's help. There are many costs associated with building our robot as well as traveling, i.e. hotel rooms, flights, etc. As a 501(c)3 nonprofit organization, we rely completely on our community’s generous donations to continue building robots and competing in the FIRST Robotics Competition. Please use the link if you are able to donate. We really appreciate your donation! Also through AmazonSmile, Amazon will donate 0.5% of your total eligible Amazon Smile purchases to our non-profit, Young Engineers Association (FRC Team 4293)! Please note that Amazon Smile is just a division of Amazon.com that allows us to receive the proceeds for purchases made only on smile.amazon.com, not on the main Amazon website or the mobile app. It costs you nothing and really helps us out! We definitely wanted to give a huge shout out and thank you to the amazing and generous event and silent auction donors who helped make our fundraising dinner possible! We won! We are now 2018 Colorado Regional winners! Thank you and congratulations to our partner alliance teams: team 3005 the RoboChargers and team 118 the Robonauts. Thank you to all of the teams in our alliances throughout the day, FIRST, our mentors, and all the volunteers that made this amazing event possible. Good job to all the teams who participated. We will soon be heading to Houston to compete in the 2018 FRC Championships. The team is super excited to go to Houston, but we need your help. There are many costs affiliated with traveling, i.e. hotel rooms, flights, etc. If you can please use the link to donate. We really appreciate your donation. Also, to view photos and videos of the competion click here, here, and here. It is almost time for us to compete at the Colorado Regionals! This Regional will be held at the DU Ritchie Center from March 22rd to the 24th. Thursday will be a practice day where we can fine tune our robot. 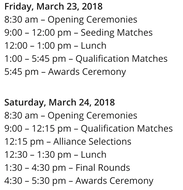 Friday and the first part of Saturday will be qualification matches where we will compete against other teams. The last part of Saturday will be finals and awards. Everyone is invited to this regional, so make sure to invite your friends and family to join us as we compete on Friday and Saturday! Below is a tentative schedule from the FIRST website. More information can be found directly on their website using the link. I now have the pleasure to present our 2018 robot, Antoinette's Revenge! Our robot has the ability to place cubes on the scale, in the switch, and in the vault, using cubes from anywhere on the field. We have put in a lot of hard work and used a lot of teamwork to build this robot. Below is a description of the components of the robot. Since the Colorado Regional three weeks ago, Antoinette’s Revenge has improved significantly, solving reliability issues, improving auto code, and gaining the ability to pick up cubes on any side. We shall begin by talking about our drive train. Our drive train is a West Coast Drive which has six 2" wheels with the center wheel lowered farther than the outer wheels. 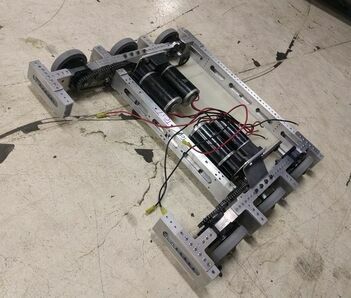 This West Coast drive system is powered by 4 CIM motors positioned in the center of the robot. The center wheels are controlled via direct drive whereas the outer 4 wheels are attached with chains. This gives us increased agility without sacrificing power. You want power cubes? We can handle that! We can pick up power cubes at any angle and on any side. Our intake uses wheels and movable arms to better gain control of cubes. It has strong springs to hold the arms together and lock in the cube, while also allowing freedom of movement to account for various cube positions. Now on to the final component of out robot: the lifter. The lift is a three stage forklift-type winch system. We used a continuous loop with fixed points on our third stage. This gives our lift increased dependability and speed. I will begin this robot reveal by saying that our robot this year is designed to work around your strategy, whatever that may be. Its modular and all around design allows us to have an adaptable strategy to tailor our alliance's needs. Lets start off this reveal by talking about our drive system. We are using 6 2" wheels with the center wheel lowered to allow maneuverability. This West Coast drive system is powered by 4 CIM motors positioned in the center of the robot as you can see here. The center wheels are powered via direct drive whereas the outer 4 wheels are attached by chains. This drive system is rather similar to our 2014 robot, Fluffy. Due to this, we knew how our drive system would perform before even building it. This year we also worked to incorporate programming into the drive system via GyroDrive. This basically uses a gyro to ensure that we drive straight and don't get pushed around. When it comes to manipulating fuel, we have got you handled. We can easily pick up fuel from the floor or the feeder station and hold it in our cloth hopper. We use 3 rollers powered by a singular motor with tubing strung between them to pick up fuel off the floor. Although our robot cannot shoot, we can easily dump all of our fuel into the low goal to snag a few points. Our robot this year was designed for an alliance, so we keep good shooters on our alliance in mind. Our robot is designed to emulate a feeder station so that we can easily refill your shooter, allowing you to keep shooting throughout the match. This should allow for a higher alliance score, as robots with good shooters no longer have to run to a feeder station, refill, and realign their shot. On top of fuel, our robot can also handle gears. Our gear manipulator's beauty is in it's simplicity. There are no moving parts and it is one solid piece. The strategy for our gear manipulator is simple; we catch the gear from the feeder station, drive up to the airship, hang it on the peg, and let the human player lift it out of the manipulator. Because there are no moving parts, this gear manipulator is consistent and fast. In autonomous, we plan on hanging a gear for 65 points, boosting our alliance score. Now on to our final portion of out robot; The lifter. once again, the beauty with our lifter is it's simplicity. Our lifter is mounted at the top of our robot and uses a single CIM with a planetary gearbox. we use a modified axle where we mount a spool with Velcro on it. For rope we use a para cord rope with a slip knot in it. We have guides mounted on either side of the lifter to guide the para cod rope as we approach. When we grab the rope with our Velcro, we begin to wind it up and use the slip knot to ensure that we have rope on our spool before lifting. Then, using our powerful CIM, we lift our robot! This whole process is incredibly fast, and because of the simplicity of it all, drivers are able to climb with limited sight to the robot. Once again, we designed this robot with an alliance in mind. Our adaptable strategy allows us to tailor our alliance's needs and adapt accordingly. If we have a good shooter on our alliance, we can reload their robot for them. If we have gear manipulator bots, we can join them to get that ranking point. We can always find a way to be useful on an alliance. We are about half way through the build season and lots of progress has been made! As of right now, prototypes are done, we are creating chassis pieces, and CAD is almost completely done. I would like to give a huge shoutout to the entire CAD team for getting all of the models created in a timely manner. I would also like to give Richard a huge shoutout for organizing extra meetings and working on CAD pretty much 24/7. There is literally nothing this guy cannot do when he is motivated. The programming is coming along great and all of the code is pretty much ready to go on the robot as soon as one is created. ​Once again, congrats on getting this far. Lets keep up this momentum and carry it all the way to the Utah regional! As many of you may have noticed, things look a little different around here! 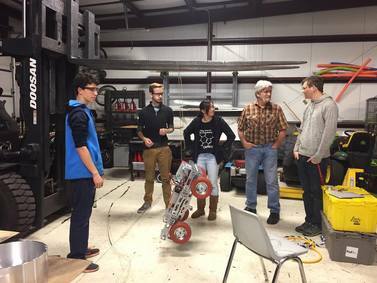 Drake is bringing a group of prospective students out to the shop to get a taste of the shop environment and see what we do here at Team Komodo! The students will be at the shop around 5:30pm on this Friday, May 20th, so we'd love for some of you guys to come help set up around 4:00. You can also help run the robot around for the incoming students and show them your favorite parts of the shop. Mike, Ryan and Don Baker will be there to help out with the shop tours, but we'd love to have students help out with them too! If you are avaliable this Friday, we could definitely use your help! I hope that all of you have gotten a chance to rest a bit with robotics done and finals coming up. I know AP's are around this time of year, so if you have to take some I wish you the best of luck! All that studying can be stressful though, so why not help you and your friends relax a bit by coming to our end of the year party this Saturday, May 7th. We'd love to see everyone there. The plan is to have the party, complete with some lunch, from 12pm-2pm at the shop. However, if you want to bring prospective students, friends or family to see the robot run around, we'll be starting robot demos around 11am. We encourage all of you guys to bring students you think might be interested in joining the team! There's always room for more enthusiastic team members, and with a bunch of students graduating this year, we welcome anyone who wants to learn more about robots! If you could bring either 1 side dish or 1 desert option, as well as your own drinks, we will provide polish sausage for an entree! This Saturday, April 2nd, four students from Team Komodo got the fantastic opportunity to demo our robot and explain FRC to the Parker Jr. FLL expo! Students Grayson Gerlich, Ryan Bacon, Aidan McDonald and Cameron Baker presented to over 75 young students from both Jr. FLL and FLL teams at American Academy in Parker. We also got the chance to participate in the awards ceremony. This included the hallowed tradition of the high five line. A big thank you to the event organizers, judges, and the fantastic Jr. FLL kids! Throughout the three rotations during the morning event, a number of kids got the chance to take our robot Twitchy for a spin! We also answered numerous questions from kids and parents about our team and FIRST Robotics in general. It was amazing to see the kids engage with what they called "big robots" and hear how interested they are in bigger FIRST programs. All of these kids will be the next generation of engineers who run the world, and we were happy to have been a part of their learning experience. Congratulations! I mean, wow, you guys absolutely rocked it this weekend. I couldn't have asked for a better team of people to compete with. All of your hard work and dedication has clearly paid off with that great competition performance. Quarterfinals guys, now thats top notch, and all of you were a part of that. No matter what part you had on the team this year, that fantastic result was something you helped to achieve. I seriously can't even believe how much fun I had this year, and I hope that experience was something you all can share! Even beyond our robot's performance, I think we made a great impression with a lot of other teams and have laid the foundation for success in coming years. Before I continue, I want each of you to pat yourselves on the back for a season well done. Thank you guys so much for making this a competition I'll remember. I'd like to give a few shoutouts to those people I interacted with the most during the competition. Without you guys, the competition wouldn't have been half the fun it was, nor would we have done as well. First, Aidan my man, you're an absolute powerhouse. I was on the phone with you basically every 45 minutes each day for scouting information, and without your communication I doubt we'd have won half the rounds we did. Also you helped with awards, delivered a stunning part of the chairmans presentation and even did some code work on the side. On top of all of that, you're a senior who dedicated your time in your final hours of high school to make this team special. And those were hours in high demand last weekend thanks to Easter, so props to you for your next level time management skills. Thank you for everything man, and the entire team is gonna miss you when you're gone. To Mary, Kyle, Sami and everyone else who was up there scouting all day, you can hold yourself personally responsible for a lot of those W's on the scoreboard. If I ever need a group of people to crunch numbers or run a professional spy ring, I'm coming straight to you. Mary, the Audubon Society called and they want their binoculars back for bird watching, but the NSA has also offered you an internship after they watched you scout. It might be a public relations job after the outstanding work you put into awards, but you'll have to contact them to know for sure. Just say "I want an internship" into thin air, they're always watching. To Josh and John who traded off the roles of safety captain and pit boss throughout all of the days, thank you. You kept the pit clean and clear, interacted well with judges and were safety rockstars. Did you see the safety sheet we got on Saturday morning? It said "Perfect!" and had a robot sticker! That's about as good as it gets with the safety inspectors. Drive team, Hardy, Drake, Cameron, Noah, you guys were stone cold pros. When we got stuck sideways in the drawbridge I thought I was going to have a heart attack. You on the other hand, remained calm and collected and pulled yourselves out AND got on the batter. I apologize for the lack of coherent sentences but I'm seriously in awe of how well you handled the stress of driving, and I am so proud of all of you. Noah, being the new guy means everyone sends you running back to the pit, but without you our robot wouldn't have worked in 4 of those matches. Thank you to all four of you for taking the entire day with a smile, focusing on strategy and powering on like workhorses. Kyle, you are a gem my dude. Every year we give you the media pass and every year I'm stunned to watch you help the drive team at every point of the process, fix the robot in the queuing line, and then step out and take photos. 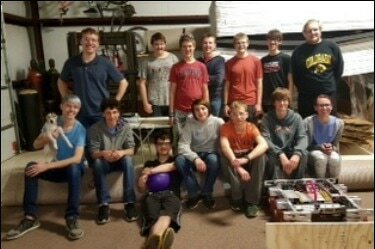 You'd think with all the stress and the fact that half the time you're replacing some robot component right before the robot goes on the field that your pictures might be a little blurry. However, you take the best looking pictures I've ever seen, most of which are probably what gets our website 1000 hits a week. To Richard and everyone cheering in the stands, thank you so much. As a former drive coach, I know that seeing all of you out there with the numbers raised high is the biggest morale boost a drive team can get. And with Richard's stellar mascot at the front of the crowd, its impossible not to feel pumped for the round. I know many of you guys had commitments throughout the weekend, so the fact that you took the time to show up and cheer us on is more than I could ever ask for. You're the lasting legacy that Team Komodo will have on the Colorado regional. I want all of you to look back some day and see that the Colorado regional 5 years from now is better for the hard work you put into cheering and making the event embody gracious professionalism. A huge shoutout to those of you who helped Mike pack in on Wednesday. While most of us were hiding in our homes under weight of snow, you guys were out there loading in all our gear. Having the pit set up on Thursday morning when we came in was a massive advantage and you made our entire team proud. Cameron I know you were there and were basically a one man show with the mentors, so thank you. Also, if you helped other teams load in on Thursday morning, keep that cooperative spirit going through life and it will take you far. I got many, many comments from judges about how they were impressed with our load-in ethic. Finally, a massive thank you to the mentors. Ashley, I know the Colorado regional would be a much different place without you. They appreciate your dedication to the regional in spades I'm sure, and we do too. Ryan, your help through the entire season was invaluable, and your steady hand and guidance at the competition was a big part of our success. And to Mike, who's work on the penny press and the robot can't even be measured, I want to give you a really heartfelt, personal thank you. I couldn't have asked for a better role model throughout my 5 years on the team. Every kid on this team knows that, without your dedication and expert advice, this team wouldn't even be close to where it is today. Nate too, you're a big part of the machining success of this team. Every mentor from other teams that came by complimented the machining that was done, and we all have your help to thank for that. As you all probably know, I'm graduating from the team this year, and the contributions of each and every one of you on this team have made this year incredibly special. I hope all of you find great success on the team, in school and in your careers. As a final, big thank you to you guys, I really can't say enough. I've never been more proud to be a part of something as big as what all of your hard work has created. 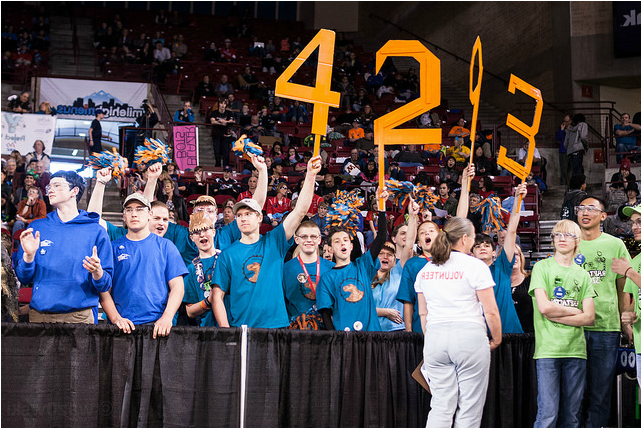 If you're looking to scout our 2016 FRC Stronghold robot, you've come to the right place! 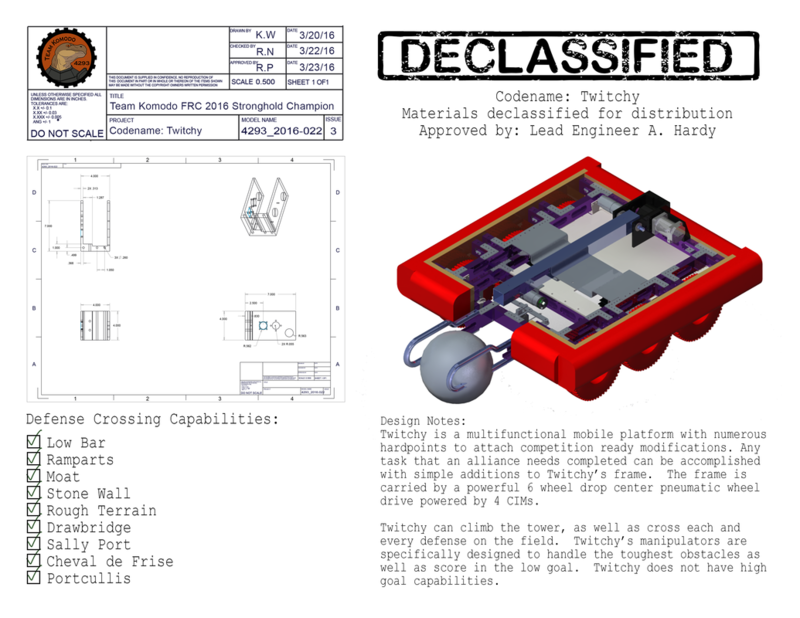 Team Komodo's "Twitchy" is a multifunctional, mobile platform with numerous hardpoints to attach competition ready modifications. If you need the short version of this post, scroll to the bottom to the tl;dr header. 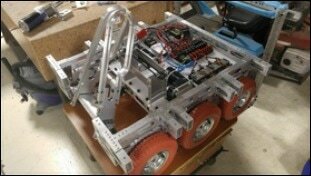 In this post we'll discuss the main three aspects of our robot: defense crossing, ball handling and climbing. We'll finish with a discussion of how to best use us in our strategy and why you should pick for Team 4293 in your alliance. Perhaps the greatest asset Twitchy offers is its modular design. As we mentioned, Twitchy is designed specifically with modifications in mind. If you need an alliance partner to do practically any task on the field, we can mount a manipulator for that task. ​​​​Lets begin by talking about our defense crossing capabilities. Twitchy runs a 6 wheel drop center (often called "West Coast") drive train with 8" pneumatic wheels. Each side is powered by 2 CIM high torque gearbox which drives all three wheels via chains. This gives Twitchy the capability to turn smoothly and speedily while maintaining high torque and traction when acting defensive. Twitchy is low enough to go under the low bar, has manipulators specifically designed for the portcullis and cheval de frise and can vault all of the other ground obstacles with ease. Team Komodo is guaranteed to handle those 6 obstacles in no time. Twitchy can also handle the drawbridge and sally port, it just takes more time. If you need a robot to defeat all of the defenses on the field, or assist your bot in crossing the tougher ones, Twitchy is your top pick! How about ball handling and scoring? Twitchy is a dedicated low goal scorer, using its manipulators to pinch and hold a ball. Its tennis racquet-esque pinchers can firmly hold the ball and raise and lower it past obstacles. Those little prongs on the pinchers, by the way, are there to help us pass the portcullis in one smooth motion. Because Twitchy can still perform tasks while holding a ball, it can grab a ball in any part of the field and bring it to the low goal to score. This makes Twitchy a very valuable pick for damaging the tower! To repeat however: Twitchy cannot score in the high goal. Finally, lets discuss Twitchy's climbing ability. Twitchy has a telescoping lifter hooked to a CIM on a 1/64 gearbox. That much power has no trouble lifting Twitchy (who is a pretty light little robot!) up above the low goal. Twitchy also has the capability to keep itself in the air at the end of the match, so watch out for Twitchy scoring big points in finals matches. The climber has a unique design in which the claw detaches from the Igus sliders for the actual climb which prevents the sliders from bending. The claw can also be secured in place for defense handling. Lets finish by talking about team strategy. Twitchy is a fast, powerful and maneuverable robot. In many of the previous regional competitions, robots like Twitchy have been successful by first breaking defenses, then playing defense. We have more than enough power to knock any high goal scoring team off their mark and our lifter arm can block high goal scorers fairly reliably. Twitchy's auto can cross any ground defense, in keeping with the defense breaking theme. However, if your robot is already dedicated to these things, Twitchy can play a tower breaking role by reliably and quickly scoring in low goal. If all else fails, Twitchy can ferry balls to a high goal scorer, or assist other robots in crossing defenses. ​Wow! Competition is in two weeks, we've got just one Saturday left before the big weekend. Thursday, March 24th through Saturday, March 26th are the dates to put on your calendar. I know some of you will be on spring break then, so I hope you're prepared to rest up and come out with some strong team spirit bright and early on Thursday! In preparation for the fantastic Colorado Regional, I'd like to make sure everyone knows what's happening. We're working on coordinating the team that will load the robot in on Wednesday night. For most of us though, we'll be showing up Thursday morning (if we can with school!). We're gonna try to snag some prime real estate in the middle of the arena again so we can see the field nicely and get that spirit on! If you're going to be there early on Thursday, please help us cordon off 20-30 seats or so. Please feel free to invite friends and family to attend the competition and add their voices to ours! There's no limit to how much spirit we can have. Friday and Saturday will be the main competition days, so we'll be hanging around the Magnus Arena most of the time. For lunch, there are some really good options less than a block away on University. Personally I'd suggest Greeks Gone Wild, they make some great gyros. If you are a parent who is interested in providing food for our hungry teenagers during one of the competition days, please contact Donna Gerlich! Last but not least, the event everyone is dying to know about, the team social, is returning this year! On Friday night after a long day of qualification rounds, you can kick back with some pizza and chat with other teams. Get the latest gossip, hear tales of finding actual good deals on FIRST Choice and finally get a chance to talk to that cute driver who absolutely destroyed your alliance a few matches ago. If any of this sounds like it's up your alley, please do RSVP for the event by this Thursday so we can get you tickets! ​If you have any further questions on locations, schedules or events, I've attached the official schedule (subject to change by Colorado FIRST), as well as some maps to the Ritchie Center where the event will be held. Please remember to check your email, as the mentors will send out a finalized schedule and an update to the food situation nearer to the competition. The season has been rocking and rolling along, we're progressing well and I can't wait to see a finished robot. Have we decided on a name for our bot yet? If so we should start making the chants now, because I know it is going to rock this regional! However, with that regional quickly approaching, it is very fortunate that Cougars Gone Wired, FIRST Team 2996, is again hosting the Annual Pre-Ship Scrimmage. The scrimmage is a huge event where we'll get a chance to see most of the teams from Colorado and interact with other robots. It is also a fantastic road-test of the scouting system. 2996 is kind enough to build a full game field every single year, and this year is no exception so please give a huge thank you to any 2996 people you see while you're there! Again, lets give a massive thank you to team 2996 for putting this event on. Without their continued support of Colorado FIRST, the Rocky Mountain regional wouldn't be the great event that it is. Finally, please remember to finish up your fundraising before the end of the build season! We need to get those sponsor letters out as soon as possible! The season is coming along great so far. I have been so pleased to see the chassis coming together, the electronics board get manufactured and new programmers learning. As of tonight, the electronics are drive ready, the chassis is getting rolling and perhaps most relieving, awards submissions are done. Please give a HUGE thank you to Aidan and Mary for their hard work late into a few nights to get those finished. Mary is very, very sick and still made a commitment to get those awards finished, and that's the kind of dedication we like to see here on Team Komodo. A reminder to everyone to work on your fundraising letters for this season! We require each student to send out 10 letters to friends/family/local businesses. If you have participated in the Applewood Plumbing event or another fundraising event throughout the season, that counts as one of your letters. It is crucial for the success and survival of this team that we all stay motivated and on top of fundraising. With this in mind, please focus on getting all of these letters out by the end of the build season. You still have 2 and a half weeks, so lets get out there and raise some money! ​Thank you for an awesome season so far, I'll catch you guys in another couple of weeks. I can't believe how exciting this is, it's barely 3 days until the 2016 FRC Kickoff! FRC Stronghold already looks like it'll be one awesome game! With all of this in mind, lets start this season off right, and get all of that motivation and excitement pushing us in the right direction. We're 5 year veterans this year folks, lets show this regional what Team Komodo can do! We're going to have our kickoff event at the shop this year, and we'll watch the kickoff vid via simulcast. The stream will start around 8:15, but the main portion will begin at 8:30 this Saturday, January 9th. Please try to be at the shop by then so we can watch the kickoff as a team. I know this is a bit earlier than typical for Saturdays, but I’m sure your enthusiasm for the season will help you get up just a little bit earlier! It is really important that we're all in attendance for the kickoff stream so we can all be on the same page for breaking out into our brainstorming groups to generate concepts. Also, please make sure to keep an eye out for the encrypted game manual. Ashley will try to share a link with everyone when she sees it. Make sure you download the file so we can open it up as soon as the game is revealed. Remember: rules govern everything we do here, so it is crucial to stay abreast of the rules throughout the season! Please also remember to bring a lunch along with your passion and enthusiasm! Finally, to anyone who hasn't signed a copy of the Team Komodo Code of Conduct, we really need that by Saturday. The Code of Conduct details each student's commitment to the team, outlines what the team expects from each student as admirable conduct, and includes FIRST's photo release waiver! If you haven't signed this and turned it in, please click on the button below, download the form from the page it will bring you to, and then print, sign and turn in the form. ​I hope to see all of you on Saturday!